While I’m normally a fairly large fan of steampunk and science fiction, I was a bit hesitant to read and review this book when it was offered. 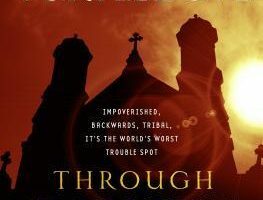 I was a little bit worried that it would be a hot mess, as the author seemed to be trying to combine too many different genres into a single story. 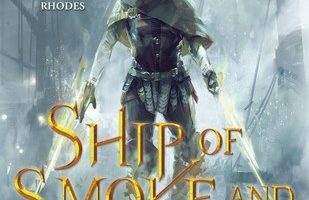 However, I’m glad I ended up saying yes, David D. Levine managed to take steampunk, science fiction, and alternate history and turn them into a single fascinating story. 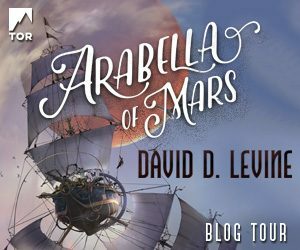 Arabella of Mars was a fast-paced and exciting read from beginning to end. I found Arabella of Mars to be a really fun story to read, I can’t remember the last time I laughed or smiled so much while reading a book. It was pretty entertaining reading about clockwork automatons, space pirates, and giant sailed ships that travel between the planets in one book. I don’t know how Levine managed to take so many different concepts and ideas, that probably shouldn’t go together, and manage to create something so good. The only reason I put this book down once I had picked it up was the fact that I had to work so early in the morning. This book had something for just about any reader in it. Anyone who is a fan of steampunk or science fiction will probably enjoy this book as much as I did. One of the nice things is that while it’s the beginning of a series, it stands really well on its own. I already can’t wait for the rest of the series, I have to know what happens next. I know I will definitely keep an eye on David D. Levine in the future, if this book is anything to go by he’s going to be an author worth watching. Check out the book trailer to get an idea of what you’ll miss out on if you don’t pick up a copy of this book soon!